We had grown quite attached to our “home” for the last 4 nights at Shina Guest House. It was great to unpack and spread out for a while and after the first night, Kati considerately moved from our triple room to a single, giving us a chance to, as she says “schnuggle”. So, we bid a fond farewell to the now familiar ancient towers and the ever-present horses and headed back towards Abano Pass. The early morning air was cold and misty and the first 15km fast and flowing to the base of the pass. We stopped to eat our packed breakfast of bread, cheese, boiled eggs, tomato, cucumber and a small custard- filled vetkoek – yum, I could’ve done with a whole lot more of those!! 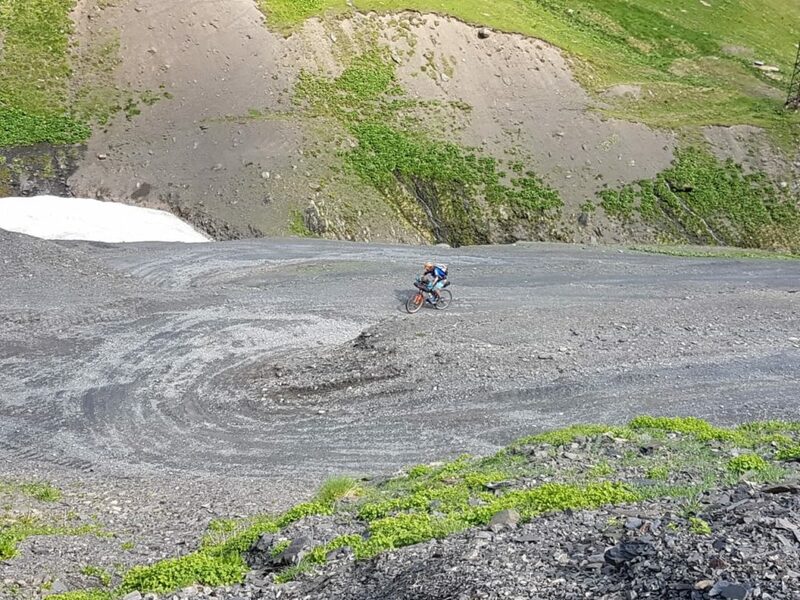 Then delay tactics over, we began our ascent – it was long and very steep in places, but it really wasn’t bad and Steve was riding so much better. When we reached the infamous glacial river crossing, would you believe it, the sock was still there hanging on the wooden stick where we’d left it! (the food was gone…). Steve flew through the rushing water again, while Kati and I watched in trepidation, then cheered in admiration (we had taken the detour). Before we knew it we were at the summit and hauling out Dora’s Cha Cha to toast our achievement ” Gaurmajo”, ” Cheers”!!. Even Steve had a thimble full. 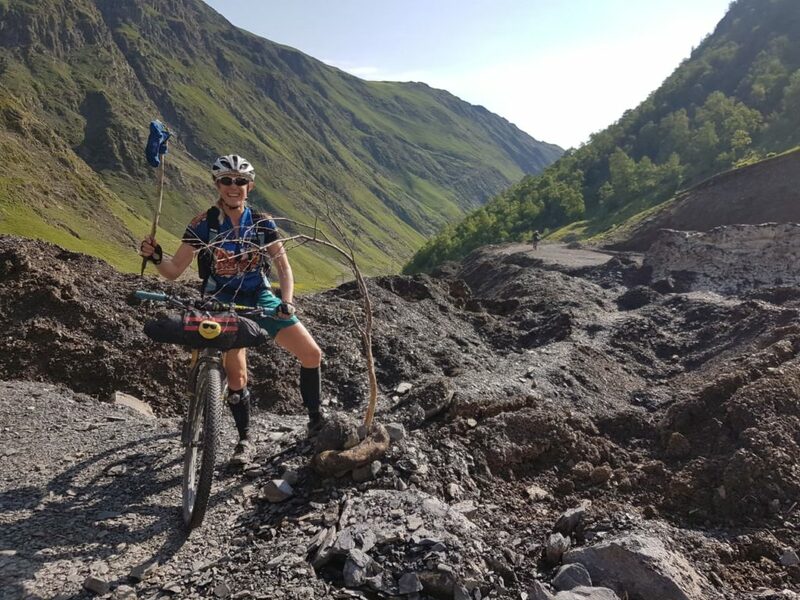 Then we headed full tilt down the 50km descent back to Pshaveli- the whole episode took us 7 hours, as opposed to the 11+ 1/2 hours (and 14 hrs) the other way. Steve reckons one of his top 10 rides ever! We arrived earlier than anticipated at 13h00. We’d arranged for our lift back to Tbilisi to collect us at 15h00. He arrived 2 hrs late, so it was quite a wait at the side of the road, where we lay like bergies with our beer and bread. If only we’d known there was a winery & restaurant just 10km down the road in the same direction as the shuttle was coming from!!!!!! By the time we finally checked into our guest house in Tbilisi, showered and got all our “stuff” sorted, it was 21h00 and I was fainting from hunger. I would happily have taken our chances at the restaurant right next door, but Kati had gotten a recommendation from our driver for a ” restaurant where the locals go, close by, not too expensive, not touristy, with authentic Georgian food”. She put the name, Samikitno, into her GPS – about 10 restaurants with the same name popped up – ” must be a chain” I said and we continued on past window after window of delicious looking food and I grew more and more famished. ” This looks good” …” that looks yummy” …” what about this one, lots of locals” … “almost there” said Kati, marching on with her GPS. We eventually found the place. The menu was clearly understandable with photographs of every dish and English explanations (not at all touristy). We’d start with this and see. If not enough, we’d order more. Food was arriving all around us and I must say it looked delicious and the portions were huge. The place was filled with locals, lots of families and youngsters. Our food arrived and it was wonderful and plentiful and cheap! We ascertained by interrogating the somewhat bemused waiter that it was indeed a chain and realized that we’d been sent to the local Spur! We had a good laugh and agreed it was perfect, then had a last toast to a perfect holiday (Kati leaves tomorrow) and headed back to bed feeling knackered and fabulously FULL!